There are many other applications for iron in biological systems, and many of these are carried out by organisms that do not generally consume “food,” such as algae. It is those organisms that are most susceptible to iron shortages in the water. What do these organisms use iron for? In most of the oceans, the growth of phytoplankton is limited by nitrogen sources (typically nitrate). In some places, however, where there is adequate nitrogen, phosphorus, and silica (if we are referring to diatoms), the growth of phytoplankton is believed to be limited by the availability of iron. Experiments have, in fact, shown that growth can be increased in some of these areas through addition of iron to the ocean. Many of these experiments are summarized by Frank Millero in his book “Chemical Oceanography” (second edition; 1996). Since the foods delivered to reef tanks contain a large amount of iron, how could the water column ever be “low” in iron? In the case of iron, there are several potentially important export mechanisms from reef tanks. Iron bound to organic molecules may be readily skimmed, depending on the nature of the organic. Iron is also taken up by the many organisms in the tank. Also, iron in the water column may simply not be bioavailable when chelated to certain organics (as mentioned above and discussed in more detail below). Finally, iron may precipitate in any of the varied environments present in a reef tank. These include high pH environments where certain additives are introduced (like limewater), potentially causing rapid formation of iron oxides and hydroxides. It is also possible that iron binds onto calcium carbonate surfaces, both those present as sand and rock, and those being created as coral skeletons and other biological structures. Let’s start with the latter. 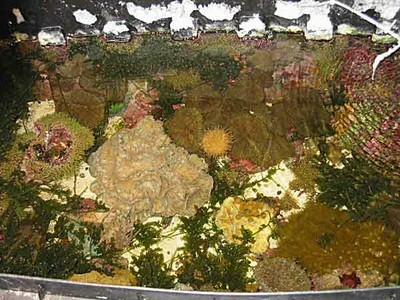 In a reef tank without macroalgae, or without adequate quantities that the macroalgae can be considered a significant sink for nutrients such as nitrogen and phosphorus, addition of iron may actually exacerbate an existing microalgae problem. It might also tip the balance toward a microalgae problem if iron were limiting microalgae growth. In these cases, I would either not add iron, or add it with an eye to stopping the addition if microalgae growth worsened. Situations that might benefit from iron would be those where there is substantial macroalgae growth, with or without a microalgae “problem”. In the case without any microalgae concern, the macroalgae may simply grow faster and thereby lower the nutrient levels in the tank that are otherwise undesirable (such as phosphate which can inhibit calcification by corals). Macroalgae growth is, in fact, one of the best phosphate export mechanisms in a reef tank, and optimizing this method may be very beneficial. 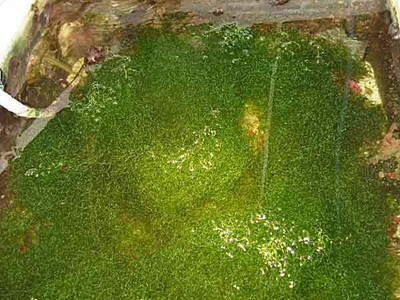 One of the author’s refugia that is filled with floating Chaetomorpha sp. macroalgae. Since the Caulerpa racemosa in my tank has never experienced sexual reproduction, and the attendant water quality problems and die-off, I have often speculated as to why it happens to some and not others. One possibility is that iron dosing is important. After all, it makes sense that if the Caulerpa is stressed, it may want to “relocate” to a better environment, and one quick way to accomplish that task is to put its energy into sexual reproduction. I recently ran a poll on one of the on-line reefkeeping forums. I provided eight possible responses and asked people to check all that applied. Here are the most pertinent ones to this article (the “none of the above” term means no iron, iodine, or bromide). Deciding how much iron to add is fairly easy because, in my experience, it doesn’t seem to matter too much. Presumably, once you add enough to eliminate iron as a limiting nutrient, extra iron does not apparently cause harm (at least that I’ve detected in my tanks or heard of from others). I selected a dose of about 0.1 to 0.3 mL of a solution containing 5 g of iron (as 25 g of ferrous sulfate heptahydrate) in 250 mL of water containing 50.7 g of sodium citrate dihydrate. This liquid is dosed 2-3 times per week to my system with a total water volume of about 250 gallons. This iron(II) citrate has turned brown and cloudy since I first made up the bottle years ago, suggesting that it is oxidizing to iron(III) and some is precipitating from solution, but I still use it. Over the past 4 years, I’ve dosed nearly all of the 5 grams of actual iron to my tank. Now that may sound like a huge amount, and it is. It’s enough to bring 800 million gallons of completely depleted seawater up to the 0.000006 ppm level that I mentioned earlier for natural sea surface water. Still, I’ve not noticed any problem, do not know the steady state concentration, do not know how high of a solution concentration is actually optimal for my tank, do not know how much is biologically available by the mechanisms mentioned below, do not know how fast it is removed by skimming and other mechanisms, and do not know what would happen if I cut it back by a factor of 1,000. All that I know is that microalgae has never been a problem since starting the iron, and I’ve not noticed anything negative that I could attribute to the iron (nor have I heard of any from others doing similar dosing). Still, I don’t keep all organisms available to the hobby, and if you do seem to get a negative reaction from something, I’d advise backing off on the dose or stopping completely. Since many hobbyists do not have access to the chemicals required to make iron(II) citrate, I’d advise buying a commercial iron supplement. There are a number available that seem appropriate and are not very expensive. Some commercial supplements combine manganese with iron (such as Kent’s product), presumably because the scientific literature has demonstrated that phytoplankton also scavenge manganese from the water column. I’ve not experimented with manganese, but it is probably fine to use if you cannot find a pure iron supplement. I’d also advise using only iron supplements that have the iron chelated to an organic molecule. The iron sold for freshwater applications is sometimes not chelated because free iron is more soluble in the lower pH of freshwater tanks. I’d avoid those products for marine applications. It will likely still work (as many of the studies in the scientific literature use free iron in seawater), but probably not as well because it may precipitate before it has fully fortified the system with iron. In many cases of iron intended for the marine hobby, the product may not tell you what the iron is chelated with, in order to protect proprietary formulations. I don’t actually know if it matters too much. Very strong chelation by certain molecules will actually inhibit bioavailability by not permitting release of the iron without completely taking apart the chelating molecule, but I expect that manufacturers have avoided those molecules. EDTA and citrate, and some others, actually degrade photochemically, releasing small amounts of free iron continually. It is believed to be the free iron that is actually taken up by many organisms, and likely iron(II), though some organisms may be able to convert iron(III) to iron(II) before uptake (the detailed absorption mechanisms are generally not known). There is a more detailed discussion of this degradation and uptake in “Captive Seawater Fishes” by Stephen Spotte (1992).